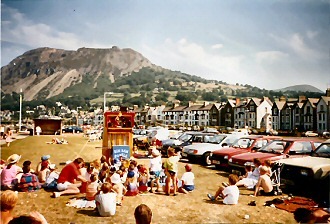 The traditional Punch & Judy Show started as a popular street entertainment, and when the Victorians discovered the joys of the Seaside, and flocked to the coastal resorts, Mr. Punch followed the crowds. Mr. Bimbamboozle enjoys performing outdoors at many carnivals and fetes, at country fayres and flower shows around North Wales, Merseyside and Cheshire. 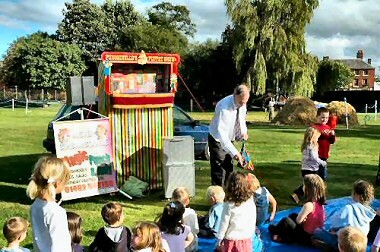 School Fun Days are becoming increasingly popular and many of these events retain all the innocent fun of the old fashioned Garden Party and Mr Punch is often a valued attraction. Since such events all take place at the weekends of June, July and August the date book becomes quickly filled. 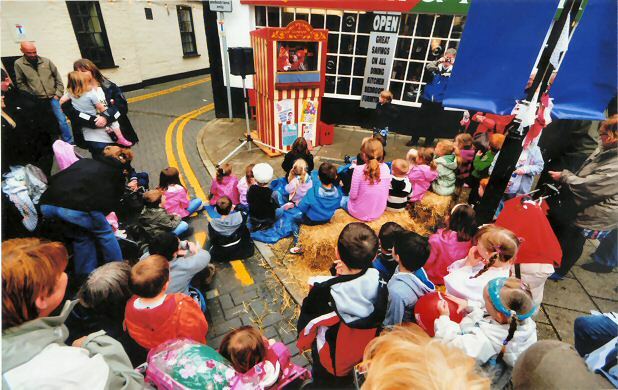 People who are keen to book Punch & Judy usually do this early in the year. Whether on a sandy beach or village square Mr Punch always draws an enthusiastic audience of excited children and nostalgic adults. Everyone loves a Punch & Judy show.